Tap Into One Of The Fastest Growing Niches In The Amazon Kindle Marketplace! Grab this 40-page PDF special report which is the written version of the webinar. Best bet... order Real Fast Kindle Comics NOW and take advantage of special pricing which ends soon! Create and Publish Comics and Graphic Novels in a Flash! You can create a great comic book. Now before you roll your eyes, let me explain. In order to create a great comic you don't have to be an artist. In fact within arms reach you probably have the only 3 tools you'll need to make your very own comic books! 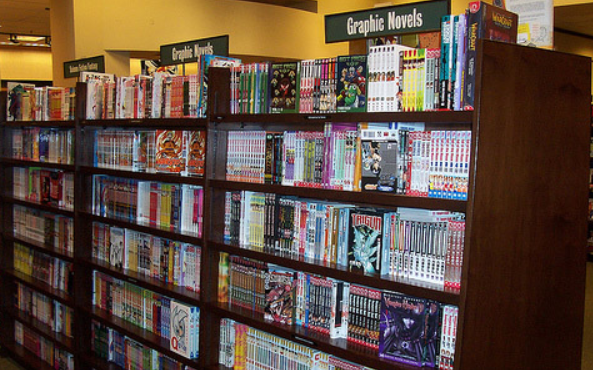 Even retail book stores now have entire sections for comics and graphic novels. Before the Kindle program was around trying to become published either as an author of a comic, graphic novel or even a regular book was more an act of masochism. In fact for many writers it meant a life of mailboxes stuffed with rejection letters from publishers. Even then, there were a few brave souls who would go through the old, expensive way of self-publishing. People spent thousands of dollars for a garage full of unsold books and comics. A New Day Dawns For the Self Publisher! A few years ago Amazon and their Kindle Direct Publishing platform turned the publishing world on it's head. They took away the pain of rejection AND removed the financial gamble of self-publishing so that now if you had a book and a computer you could get your book published, fast! They first set their sights on the book market and in just a few short years they became the 800 pound gorilla of digital publishing. In fact they're so serious about it that they've created a completely FREE proprietary software called Kindle Comic Creator that we can use to begin publishing comics! Now remember when I told you earlier about the 3 things you’d need in order to use this program? The types and styles of comics and graphic novels that you can create. How you can make not double or triple but quadruple dip profits from just one piece of your content. How to use FREE and low-cost software to create your illustrations and pictures. How to use your camera or your smartphone to tell your story in a progressive fashion - This is the secret sauce of creating a good comic. Knowing when you should use your photo as-is versus coming up with an illustrated version of the photo. How to build out your comic pages. Working with typeface and conversation bubbles. The correct sizes and formats of Kindle comic creators. Working with comics and graphic novels and the differences between them and why you would go with one style over the other. Now of course like all of our products we will have a 30 day full money back guarantee. If for any reason (or no reason at all) you don’t LOVE this training then simply contact us for a refund. If you love finding new ways to publish and make money then I think you’re really going to enjoy what we have to show you. This is top of the line training that can open up a whole new publishing market for you! Plus you are fully protected by our 30 Day Money Back Guarantee!